This blog post feels awkward - and even a little bit self serving - but I need to share some pretty amazing news that has left me shocked and flattered and more than VERY honored. Out of over 2,000 submissions, the committee has chosen one of your posts to be among the 25 Honorees in the Heart category. I was stunned. Every year that I've been in the blogging world, I would look forward to the "Voice of The Year" list. I'd go through and read each and every one. I never - in a million, trillion years - thought I'd see my name on that list. That thought never even occurred to me. At BlogHer.com, you’ll find the best conversations led by women in social media. A curated selection of authentic voices. Life well said. Today, BlogHer is the largest community of women who blog: 92 million unique visitors per month (March 2013, Nielsen Site Census). Engaged, influential and info-savvy, these women come to BlogHer to seek and share advice, opinions and recommendations. BlogHer’s team works hard to bring you the best and brightest conversations, writers and speakers – online and in person. That’s what we do best. 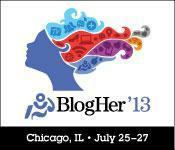 Ironically, I had planned to attend the BlogHer conference in Chicago this July. It would have been my very first BlogHer conference... not to mention, my first solo trip away without Ed or children! I was even set to share a hotel room with my friend, Ellen, from "Love That Max." But then... Gavin died. And everything changed. I sold my ticket and we made plans to go to Gavin's favorite place as a family... Ocean City, New Jersey. As much as I would be so, so honored to stand on that stage with my fellow nominees - and meet many of the women who have inspired me over the years - I really can't think of anywhere I'd rather be than by the ocean. At least this year. And anyway, it was Gavin's story that prompted a reader to nominate me. In my eyes, this honor is all his... I'm just the messenger. And to me, the greatest honor of this BlogHer accomplishment is knowing that more eyes will be on Gavin. More hearts will fall in love with him after reading his story. More people will get to know him and maybe even be inspired by his journey. Those thoughts make me so happy. So if you're missing me at BlogHer, I'll be sitting by the Ocean celebrating with my little boy. Thank you to Andee... and to the reviewers from BlogHer who had the impossible task of reading and choosing from so many beautiful pieces. I am still completely overwhelmed. Congratulations! This is very well-deserved. Gavin has touched many hearts through your writing for those of us not lucky enough to meet him in person. Thank you so much for sharing him! Kate - This is so awesome! I have said it before and I will say it again--Gavin's life and death have started something big, something I can't fully wrap my mind around. He is spreading so much GOOD in this world, and this will continue his mission. You have said that Gavin helped heal two broken people. I think maybe he is helping to heal a broken world--by letting those of us trying to make a difference know that we CAN make a difference, that we CAN be a force for good and hope and compassion. Especially if we do it together. I am so pleased for you, Kate--and so proud of you and Gavin. I read all of the blog entries and they are ALL amazing!! Thank you for posting them here Kate. Congratulations Kate :) I am sure Gavin is smiling down on you right now. Congratulations, you had a moving post, one I wish you didn't have to write.